I’ve been dealing with some health issues this month. Nothing terribly serious but just a constant annoyance. A visit to the doctor tomorrow may provide some answers. 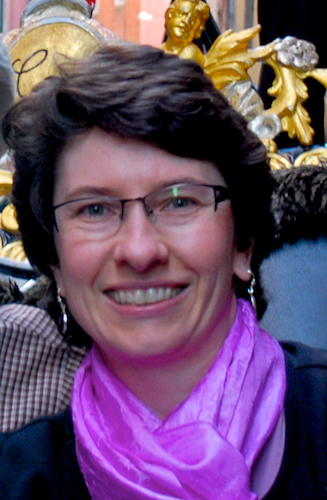 But in dealing with this health issue, I have, several times, felt like I’ve lost control over my body. Your mind can take you to dark places if you let it. At other times, I’ve felt like I’ve had the upper hand. 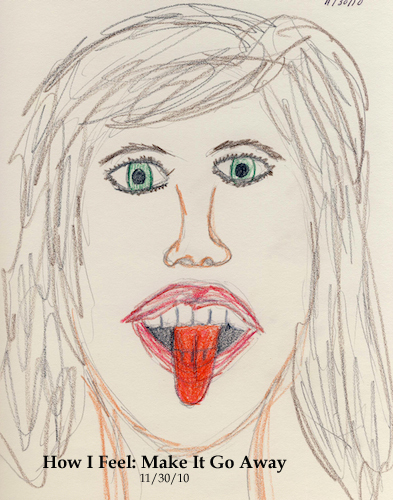 This morning, as I sat in meditation, I had this brilliant idea to draw how I’m feeling. To sketch my mood, hopefully each day, as I resolve this situation. They say art can be therapeutic and bring healing. I know I’m most happy when I make my art. Maybe creating a daily drawing will help out in other ways too. Here is the result of putting pencil to paper this morning. Yep, I’m sticking my tongue out at this annoying little issue. Go Away. Today I discovered the Hippy Urban Girl blog and her December Views project. I love the idea of taking a snapshot of your day and using that to describe your mood or what you’re doing or whatever is going on around you. I signed up for the project as an additional way to deal with my current situation. Best part is there are no rules! 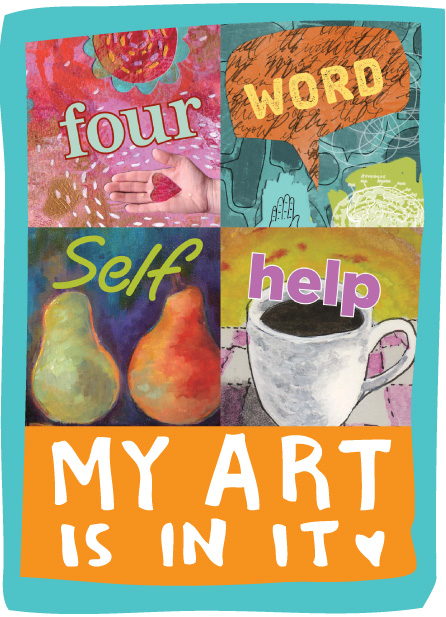 Categories: Amy's Art, art, Balance, Creativity, health, intention, Intuition, Networking, Philosophy, Spirituality | Tags: art, colored pencils, control, Creativity, disease, drawing, emotions, fear, health, Illness, Inspiration, intent, life, Nature, philosophy, self-portrait, sick, Spirituality | Permalink. 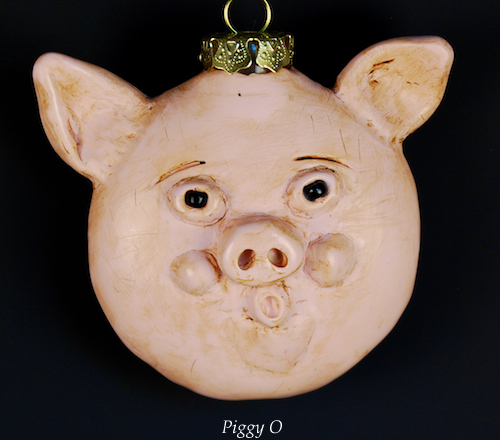 Last week I introduced you to my newest creations, beginning with the Piggy Ornament. 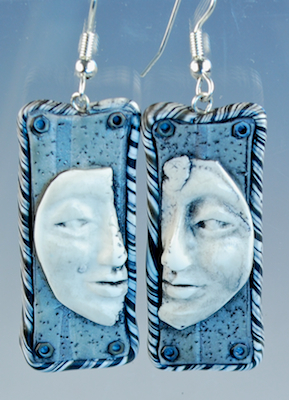 Here are two of my latest ornaments, just in time for the ArtSpace Holiday Show this weekend in Maynard. You know I have to make cats. Poor kitty. Seems I forgot to give him a tail. 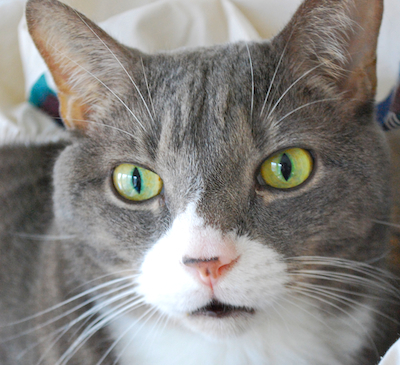 Hmm, do you think these cats are inspired by this guy? Just can’t help it. Woody is a wonderful source of inspiration for me. Still to come: another Piggy, Mr. Bundles, and the Ostrich. 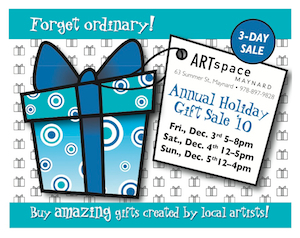 Don’t forget the ArtSpace Holiday show this weekend, 12/3, 12/4 and 12/5 in Maynard. 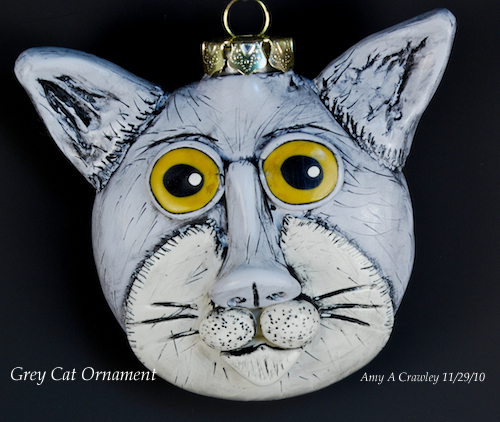 Categories: Amy's Art, art, Creativity, Developing a line of work, Humor, Mixed Media, Polymer Clay, Sculpture | Tags: art, Cats, Christmas, Creativity, grey cats, holly, Humor, ornaments, Polymer clay, Sculpture | Permalink. Categories: Inspiration, intention, Philosophy, Quotes, Spirituality | Tags: dreams, emotions, fear, gratitude, Inspiration, life, philosophy, Quotes, Spirit, Spirituality, Thanksgiving Day, The Terma Collective | Permalink. Last year I made a few Santa and Snowman ornaments for the holiday shows. Those ornaments were made over used light bulbs. 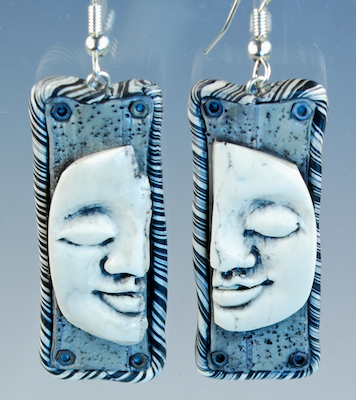 You can see them on my ArtFire studio page. The Santa ornament became a class I taught at Ink About It earlier this month. This year I pulled out a box of glass ornaments that have been in my studio closet for…well, a long time it seems. This is a familiar routine because each year I pull them off the shelf, stare at them, tell myself that I either create something with them or donate them to Freecycle. They usually go back on the shelf, you know, cause I really might make something with them. And guess what? I DID IT! 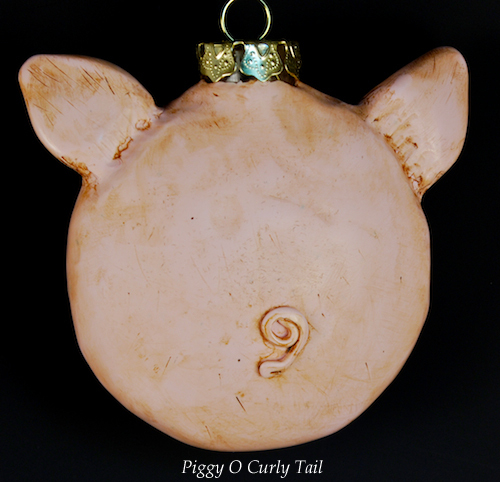 Piggy O is made from custom colored polymer clay and sculpted over a flat glass ornament. She is hand sanded, buffed, and given a patina for an aged look. And she even has a curly tail. 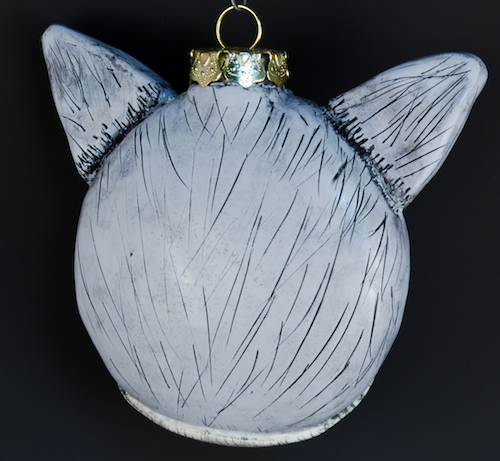 Categories: Amy's Art, art, Business, Creativity, Developing a line of work, Humor, Inspiration, Mixed Media, Polymer Clay, Sculpture | Tags: art, ArtSpace Maynard, Christmas, Creativity, glass, Humor, Mixed Media, ornaments, Pig, piggy, pigs, Pink Floyd Animals, Sculpture | Permalink. A few days ago, Polyform Products announced several color changes to their polymer clay line up. Polyform Products produces Sculpey III and Premo! polymer clays along with numerous accessories to use with polymer. In the announcement Polyform revealed the addition of several new colors to both the Sculpey III and Premo! lines. Along with the announcement of several new colors, however, was the revelation that a number of popular colors would be discontinued, including Red Pearl, Green Pearl, Cobalt Blue, Sea Green, Copper, Zinc Yellow, Frost, Fluorescent Green, Fluorescent Yellow, Fluorescent Red and Glow-In-The-Dark. I am heartened by the passion of my fellow polymer clay artists in their response to the Polyform announcement. While many of us look forward to seeing the new colors, we are also equally dismayed by the loss of two primary colors. Polyform has stated that “recipes” will be available on their website to recreate most of the discontinued colors. But as more than one polymer clay artist has asked “How do you recreate a primary color?” And given the variability in the mixing process, how will the same color be recreated on a consistent basis? What disappoints me more, however, is what appears to be a disregard for the customer. Many are asking if a customer survey was conducted prior to this decision. That question remains unanswered. Unfortunately, it does appear that this decision may be based more on sales numbers. Now I don’t know what percentage of people who buy Premo! are polymer clay artists. Nor do I know how many of those artists buy the soon-to-be-discontinued colors. But it seems, according to Polyform Products, that either there aren’t enough of us or we aren’t buying enough of these colors to justify their continuation. As a small business person, I understand some of this logic. I, too, have discontinued color designs from my lines of artwork because those designs didn’t sell well or perhaps they sold well initially, but then sales leveled or fell off. 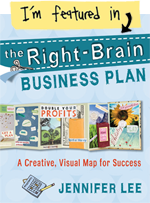 I understand that businesses need to keep their product line fresh and maybe an item is discontinued, made available as a special order, or brought back for a limited time only. But how does a company decide to eliminate two basic, primary colors that are key to the creation of so many other colors? Many have asked if Golden or Liquitex or Winsor & Newton would eliminate primary colors from their lines of paint. Perhaps we were too complacent, believing that certain colors would continue to be made available. Perhaps Polyform didn’t fully understand the importance of these colors to polymer clay artists. The reality is that Polyform Products risks losing a number of customers should they proceed with their decision to eliminate Cobalt Blue, Zinc Yellow, and several other colors. They risk driving into the welcoming arms of their competitors the customers who have stood by them, tested and promoted their products. Maybe this groundswell of voices will convince Polyform Products to reevaluate their decision. Categories: art, Artists, Business, Creativity, intention, Philosophy, Polymer Clay, Teaching | Tags: art, Business, cobalt blue, Creativity, intent, money, Polyform discontinues colors, Polyform Products, Polymer clay, product line change, zinc yellow | Permalink. Categories: Inspiration, Philosophy, Quotable Monday, Quotes, Spirituality | Tags: beauty, dreams, Eleanor Roosevelt, future, goals, Inspiration, life, philosophy, Quotable Monday, Quotes, Spirituality | Permalink. In the run up to the Bolton Artisans Guild’s 7th annual holiday show this weekend, I found myself playing around with the idea to make earrings. Yes, earrings. Something I have not done in several years. Perhaps it was working with the students in my Polymer Clay Boot Camp class that triggered this idea. Or maybe it was my desire to try something different. Whatever it was, I did indeed find myself sketching an idea for earrings. 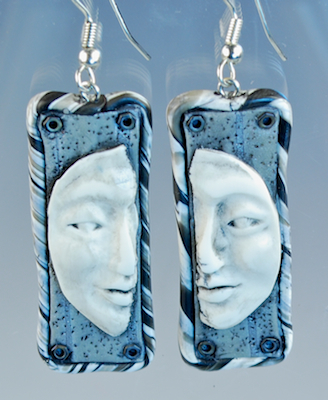 Earrings that were inspired by our recent trip to Italy and influenced by the ruins of Rome and all the sculpture. 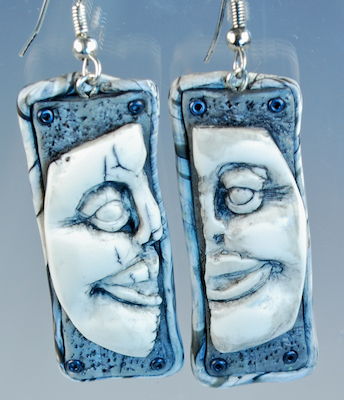 The result are these Roman Pillar Face Earrings. 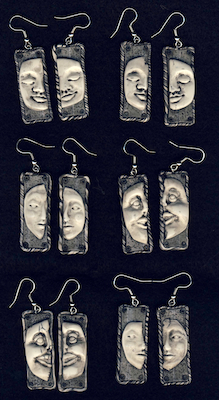 Each earring features a face taken from a mold of one my hand sculpted faces or from one of many face molds I’ve collected over the years. 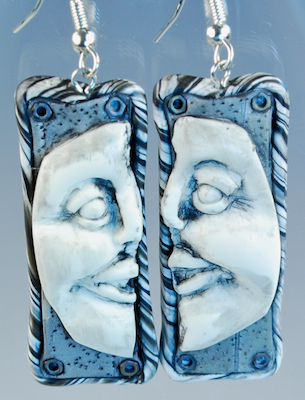 The face is mounted to a background of textured pearl and black clay and framed by a rope of twisted black and white clay. After curing and sanding, I applied a patina of black acrylic and then buffed each piece to a nice sheen. 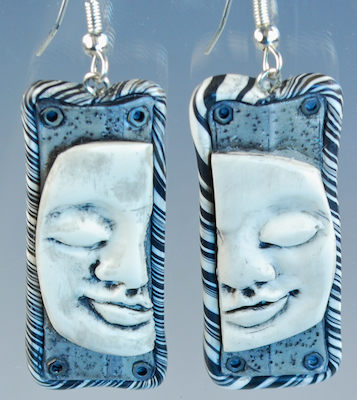 The earrings are 1.5″ long and .5″ wide. I created two pairs with each face. What I found intriguing was that even though a particular face mold was used multiple times, no two faces ever came out the same. Each pair has its own personality and distinct qualities. Creating these earrings has been a lot of fun. It feels good to create something different from my usual small scale sculptures. Sometimes stepping out of the box and trying a new (or returning to an old) format can ignite ideas for future work as well. 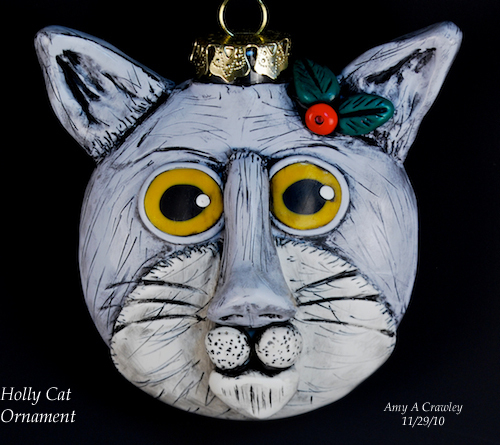 Categories: Amy's Art, art, Creativity, Developing a line of work, Inspiration, Mixed Media, Opportunity, Polymer Clay, Rituals and habits, Sculpture | Tags: art, Art shows, black, black and white, Creativity, Earrings, faces, Inspiration, Italy, Mixed Media, Pierced earrings, Polymer clay, Rome | Permalink.